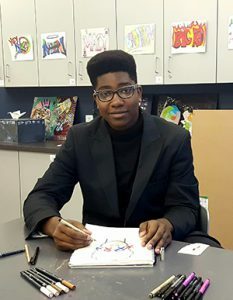 A street art project in a Tech Valley High art class gave junior Gabe Boyd a deeper understanding of his roots and his artistry after learning that his uncle was the “king of graffiti” when the movement emerged in New York City in the 1970s. Boyd’s late uncle was Clifford Goodman, who was known as Cliff 159. His graffiti name stems from the location of his childhood home, as Goodman grew up on 159th Street with his parents, Boyd’s mother Holly and their four siblings. Boyd said he never knew his uncle, as he passed away before he was born. Boyd had no idea his uncle was an artist until his mother told him about it during discussions about his current art project, which is about conveying a social message in a style inspired by a graffiti artist. According to the Museum of the City of New York, Cliff 159 started writing in the Bronx in 1970. He specialized in whole-car pieces and also was one of the first writers to incorporate comic characters like Beetle Bailey into his work. Goodman was the leading founder of the “3 Yard Boys,” which was referred to as the largest and most prestigious writing group in the city in a 1976 video titled the “New York Graffiti Experience.” The video dubs Cliff 159 as “the king of graffiti,” and includes a voiceover interview with him. “I just liked seeing my name,” Goodman says in the interview, talking about how he got started. “I’d leave my name wherever I went … just to say I was there. When I started to get in on trains, the first few months I just want to have as many cars as possible so people could know who I am.